Function procedure can be called from another VBA procedure. You can use it a worksheet formula like predefined Excel functions. Precede the function’s name with a file reference. 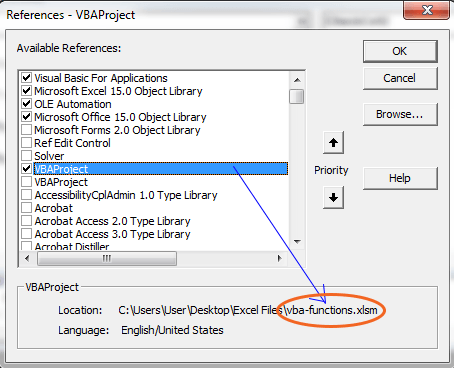 Custom functions can be called from another VBA procedure (VBA functions or VBA Sub procedure whatever it is). Whatever the amount this function returns, is assigned to the Tax variable. We use a custom function in a worksheet formula just like we use predefined Excel functions. However, you have to make sure that Excel can locate your custom function. There exist two cases: your function procedure can be in the same workbook or in the different workbook. If the function procedure is in the same workbook, you don’t need to do anything to locate the function for Excel. If the function is defined in a different workbook, you may have to instruct Excel where to find the function. =’vba-functions.xlsm’!NumberSign(A3). 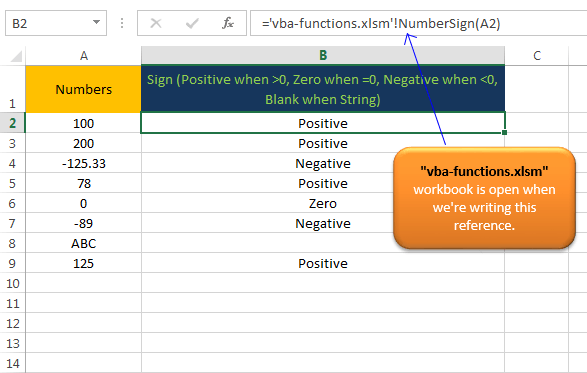 vba-functions.xlsm workbook must be open when you’re writing references for Number-check.xlsm workbook. See the image below for a clear idea. Referencing workbook to use its defined function. If you insert the function with the Insert Function dialog box, the workbook reference is inserted automatically. To activate Insert Function dialog box choose Formulas ➪ Function Library ➪ Insert Function Wizard. You can create references to the workbook where the custom function is defined. In this process, you don’t have to precede the custom function name with the workbook name. In the VB Editor, choose Tools ➪ References to establish a reference to another workbook. See the following figure. A list of references is presented including all open workbooks. Place a checkmark in the item that refers to the workbook that contains the custom function. If the workbook isn’t open, click Browse to choose the workbook. Select the workbook where the custom function is defined to create references. You can create an add-in from a workbook that has function procedures. In this case, you don’t need to use the file reference when you use one of the functions of the workbook. Just you need to check that the add-in is installed.